By now you know that Washington Square Park not only my neighborhood park but it is my favorite NYC park. I am always on the look out for narrative and visual information about the park for personal reasons as well as for my work at WSP Eco Projects. In January I came across Joel Grossman's historic GIS of the park. If you are not familiar with the acronym, GIS stands for geographic information system within which you store, analyze, and display layers of spatial data. I present the geographic data here with permission of Dr. Grossman. 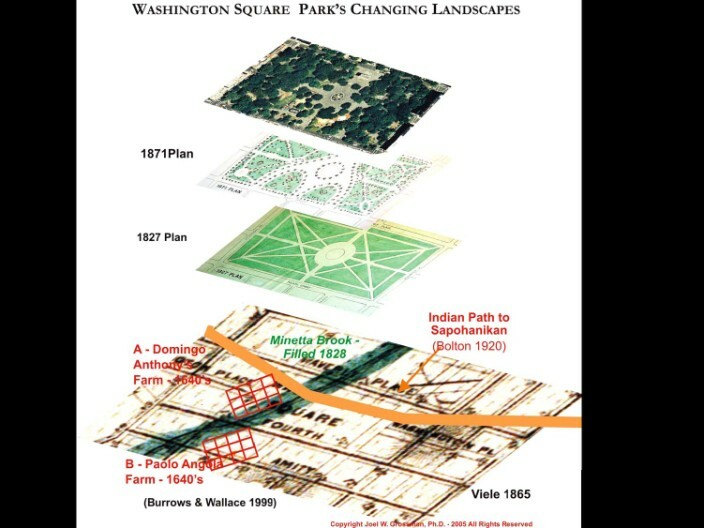 First image shows the use evolution of the land that is now Washington Square Park. The next two images are segments of Viele Map of 1865 showing Minetta Brook with an intersecting Lenape trail. This trail was recorded in Reginald Bolton's Indian Paths in the Great Metropolis (1922). 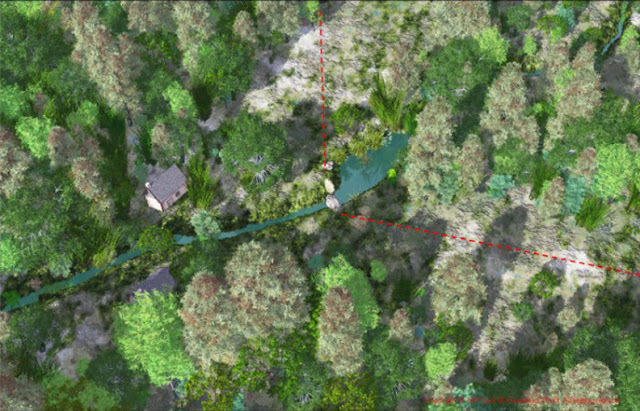 The final two images are of 3D terrain models highlighting the brook, the trail, and Grossman's estimated location of two mid-17th century farms owned by black freedmen. 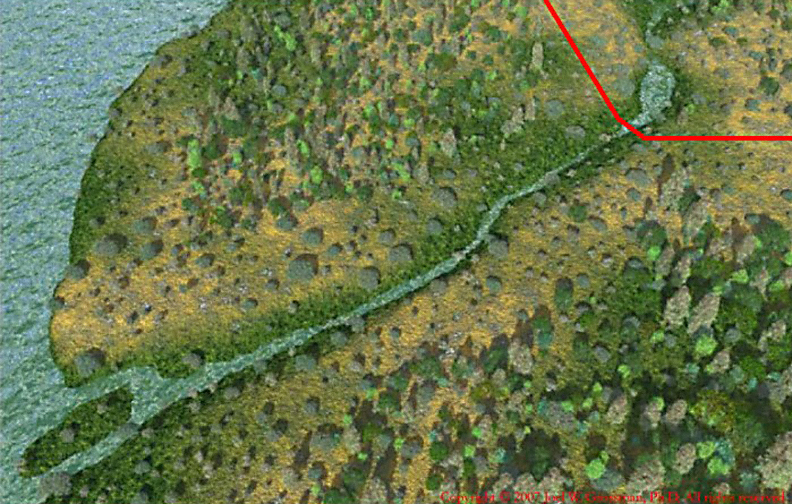 [Detail of Viele 1865 with Bolton's Native American path superimposed to scale. Joel W Grossman © 1991 - 2007. All rights reserved. The land that is now Washington Square Park was once owned by freed Africans, former slaves of the Dutch West India Company(GVSHP via 6sqft). Anthony Portuguese, a former slave, was given 6.75 acres of land from Wouter van Twiller's 100 acre farm. 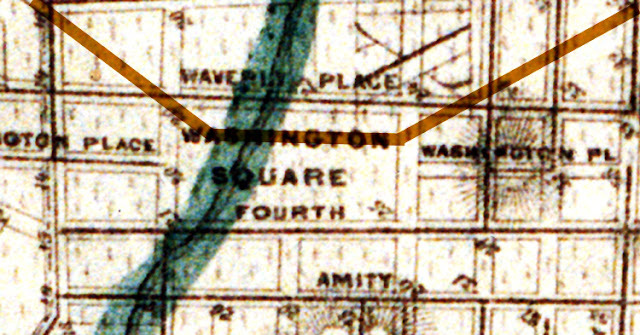 Anthony Portuguese's acreage was east of Minetta Brook and extended south beyond the borders of today's Washington Square Park. The farm of Manuel Trumpeter (or Trompetor), another freed slave, only overlapped with the current NE edge of Washington Square Park. Most of Trumpeter's farm was east of the park. Paulo d’Angola was brought to New Amsterdam on the first ship of enslaved Africans in 1626. He was granted a six-acre plot on July 14, 1645. This landholding is part of present day Washington Square Park. Another freed slave was granted land is part of the present-day park. On September 5, 1645, Anthony Portuguese settled on a 12-acre parcel with bordered roughly by Waverly Place, West Third, LaGuardia Place, and Sullivan Street. The Lenape path that ran through Washington Square Park is shown in Bolton's book as a westward offshoot of the main north-south thoroughfare (aka Broadway). Bolton recorded the trail's end point as "Sapohanikan". 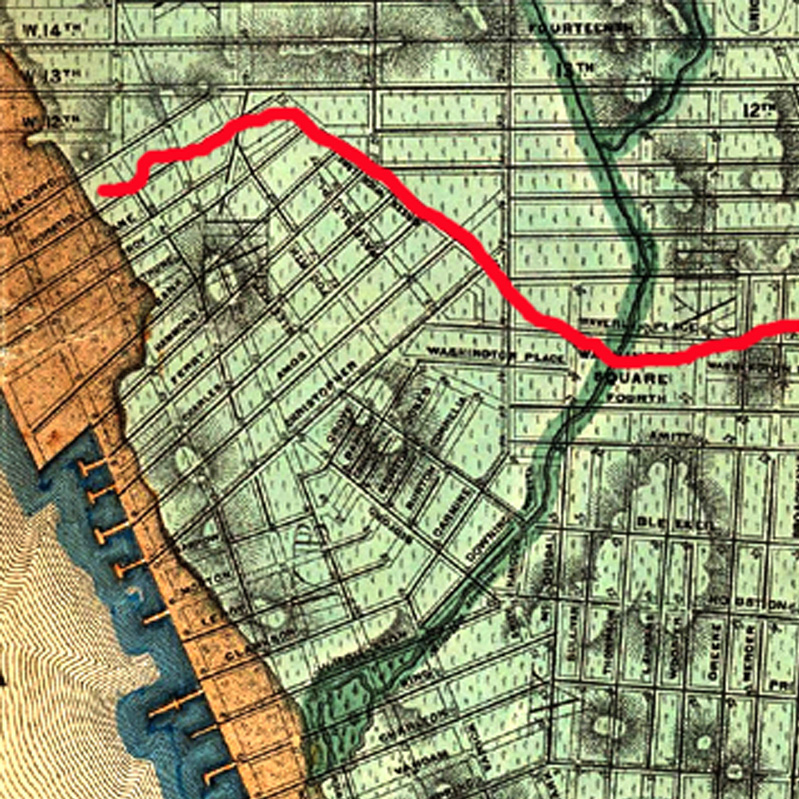 Burrows and Wallace (Gotham: A History of New York City to 1898) list the trail's westward end as "Sapokanikan." A cove existed where the trail met the Hudson River at present day Gansevoort Street and it was used as "a site of fishing and planting." I too have a love for maps and imagining earlier days of the same territory, and how topography has changed. What a treasure for you to come across and share! I have never been to Washington Square Park, but know other urban parks in my heart. Love the shots of the scale models.